What is the best way to manage spelling in the classroom? When I was a student, everyone had the same list every week. But this is not the best approach. A single list will be too hard for some students, but too easy for others. Over the years, I've experimented with several different ways to differentiate spelling. Each one has its own benefits and drawbacks. I tried this when I taught in middle school. After administering the Words Their Way spelling inventory, I grouped students into three groups based on their level. I had a Within Word Pattern group, a Syllables and Affixes group, and a Derivational Relations group. The benefits of this arrangement are clear--students had words that matched their developmental levels. However, it turned out to be very difficult to implement. Each week I had three lists to juggle, and I had to create time in the classroom schedule to meet with three different groups for pretests, teaching, and post-tests. I felt like I was going crazy! I didn't have the Words Their Way word list books when I was doing this. These books would help tremendously. In fact, my husband uses them to support multiple spelling groups in his third grade classroom. He has been doing this for several years and finds it worth the time it takes to manage. His secret is to use one routine homework assignment for all groups, with targeted word sorts for students according to their levels. When my language arts block took a time cut, I knew that I couldn't do multiple groups any more. But I still wanted to differentiate. I solved the problem by creating tiered lists. Each week, we studied a spelling pattern. Students were placed in a basic list or a more challenging list based on how they did on a spelling pretest. For example, a list including different spellings of /au/ (aw, au, and ong) might include a word like launch on the basic list, and distraught on the more difficult list. All students would study the root for the week, aud-, as it fits the pattern and is a source for learning vocabulary words. This turned out to be very workable. I could spend time doing whole group lessons that focused on the spelling pattern or principle. Students would spend their time studying the simpler words that had the pattern, or the more difficult ones. All students would work to learn the meanings of the words. The spelling test consisted of whichever word list students were responsible for learning that week, plus some multiple choice vocabulary questions. The tricky part with this arrangement is creating the lists. I posted the full set of lists that I created for free over at TeachersPayTeachers. Once the whole thing is put together, it becomes a fairly simple routine. If you have several teachers who are willing to work together, you can try regrouping students according to their spelling level. The benefits of this are clear. Not only will students be working with words at their developmental level, but teachers will only have to plan for one group. Hooray! Of course, there are some drawbacks to this. It can be difficult to schedule, as you need a time period in which all teachers can switch. We found that, for three classes of fourth graders, we really needed to have 4 or 5 teachers. This is because students at the lower levels needed smaller groups. Luckily, we were able to pull in the special education teacher for our team, which worked quite well for all of us. Students working at the Syllables and Affixes level or Derivational Relations level had larger groups, while those who were struggling had smaller groups. Another problem is keeping track of work between the groups. This year, we're hoping to make working on spelling a non-negotiable task for all students at the start of the day. We want to make sure that there is time in the school day for students to practice their words. When we leave it for homework alone, there will always be some students who don't complete the assignments and don't progress. Each one of these methods can work, and can help students to become more successful with spelling. The key is creating a system that works for you, and for your students. When you keep the focus on learning patterns, listening for sounds in words, and linking spelling to vocabulary, you can make spelling work for all of your students. Several weeks ago, as part of an assignment for a class, I administered the QRI to my son. He breezed through the readings and answered the questions easily. When it came time for the retelling of expository text, though, he faltered. "I was supposed to retell this?" he asked. "Why didn't you tell me that before we started?" Not surprisingly, his retelling was not the best. "If this were a story, it would be easier," he muttered as he tried to pick his way through what he remembered about immigration. Retelling a story is always easier than retelling expository text. Stories are written to naturally fit together. Each event leads to the next, making remembering the details fairly simple. Expository texts, though, are not always written in chronological order. The details do not always fit together so simply. Like my son, many readers find retelling expository text to be quite a challenge. This is a shame. Retelling expository text is one of the best ways to help students make sense of content area readings. As students retell, they have to think about the important details, figure out how ideas relate, and connect new ideas to existing schemas. One of the best ways to help students retell nonfiction is to model retelling parts of texts. Show students how to use the headings and other text features as road maps for getting around in the text. Don't be afraid of sharing your own mental processes with students. I've often told students, "Wait--let me try putting that in a different way." This shows them the flexibility that is a part of retelling. Figures and pictures are just as useful for expository text as they are for narrative texts. In fact, picture and figures can help kids to remember key ideas. One thing I have learned about fourth graders is that they always like to be playing around with something. I think it's better for them to play around with something related to the text than to play around with their erasers! The pictures can also be a powerful tool for previewing. Try giving students the pictures before they read so that they can use them to form predictions. I've posted a packet about retelling nonfiction texts over at TeachersPayTeachers. The text, which I wrote a few years ago, explains how baby painted turtles survive the winter. Retelling figures are included. As you can see, retelling figures don't have to be fancy artwork. Simple line drawings will do. The packet also includes a generic set of directions to help students retell nonfiction. And what about my son? Well, once he knew that he had to retell the text, his reading process changed. On the next selection, he read more slowly, and was ready to retell the text at the end. "That wasn't so bad," he said at the end. "Do you have any more tests for me? I think they're fun." Well, I was out of tests, but I'm sure that his sixth grade teacher will have a few ready for the first day of school! At a workshop last year, two teachers told me that their principal frowned upon retelling. Because they taught at the intermediate level, they said, their principal said that they should be focused more on summarizing, and less on retelling. I think this is a misguided view that reflects assessment more than instruction. 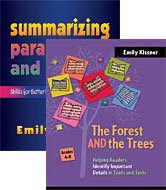 It's true that reading assessment in the intermediate grades focuses more on summarizing than retelling. On the DRA and the PSSA, students are asked to summarize instead of retell. However, from an instructional viewpoint, retelling offers benefits for students of all levels. When students retell, they have to go beyond a surface level understanding of a text, delving deeper as they try to put ideas into their own words. Often, retelling will cause readers to generate new inferences and new ideas. Retelling requires some serious thinking! Retelling is also an authentic activity. While adults don't often sit down to write summaries, they do often retell. What happened on that show last night? What is the twist ending to the movie? What went on at that faculty meeting? These conversations lead to retelling. Many retelling materials are geared toward younger students. Older readers, however, need different scaffolds and different prompts. As stories become more sophisticated, students need to use words like "meanwhile" and "however" to explain the events. Students need to figure out how to explain events that happen from the point of view of one character only, how to deal with complex timelines, and how to explain information that one character knows, but other characters don't. As you move into text, it helps to give students something tangible to hold and move as they retell. Some students do not think about how characters move in time and space through the course of a story. Retelling with pictures or figures helps them to conceptualize this and "see" the story. What do you do when a kid asks you how to spell a word? The standard procedure, as practiced by many, is to refer the student to the dictionary. But this is a lengthy process--and, for many students, a frustrating one. Looking in the dictionary can take a student up to six minutes. (I know, because I've timed it!) When I'm teaching writing in a 40 minute time block, I can understand why a student would be reluctant to use up precious writing time just to find the spelling of one word. As adults, most people use a very practical spelling strategy: Find someone who is a good speller, and ask them. Depending on the expertise of others is not a bad strategy. So, when students ask me how to spell a word, I used to just jot it down on a sticky note. But this spring I wanted to try something new. What could I do that would give some of the work back to the student? What could I try that would be more supportive than just referring the student to the dictionary? I decided to use a version of Wheel of Fortune. When a student asked me for a word, I put lines for the number of letters in the word. This gave me instant information on which word parts and syllables the student was able to spell, and which were problematic. She tried it out on the lines, checked with me, and quickly went back to writing. The lines offer an added bit of support, especially for words with doubled letters and odd vowel patterns. If a student thinks that she has spelled the word correctly, but has a letter left over, then she knows (without my intervention!) that he has to go back and rethink. Sometimes, I needed to give a little more support. Depending on what I knew the student has trouble with, I provided some chunks. For example, one struggling speller asked how to spell tractor. I wanted to see if he could come up with the complex consonants in the first syllable. The -or ending, however, is a little odd, so I wanted to give that part to him. What is so neat about this strategy is that it allowed me to get instant information about what students could and could not do. I could see exactly what part of the word caused the problem, and do a little quick teaching about the pattern or the exception. For students, the lines for letters made it a little more like a puzzle, and they were more willing to retry a word several times. I knew this strategy had taken root when I saw students using it with one another. "How do you spell later?" one student whispered to another. When I looked over, I saw that her neighbor had drawn out lines for her. It's always neat to see kids teaching one another. Toward the end of school, I started to worry about my students' spelling. I had a vague notion that our program wasn't working as well as I wanted. But how could I know? I tried a little experiment that was time-consuming, but illuminating. After a field trip, I gave students a prompt to write a paragraph. They had 5 minutes to plan, after which I promised that I would tell them how to spell words that they wanted. I wrote all of the words on the dry erase board. Then, they had the rest of the class (about 30 minutes) to write their paragraphs. But it was the next step that told me the most. I tabulated the misspelled words, filling two sheets of paper with information about which words students were misspelling and how many students were misspelling them. These were the words that students didn't know they were misspelling. Remember, I had filled the dry erase board with the "harder" words they wanted to have spelled for them, mostly the proper nouns and specific vocabulary that related to our trip. And I saw some interesting patterns. Students were very weak with contractions. "Different" was frequently misspelled, along with words with complex vowel patterns. There were also the predictable problems with are/our and there/their/they're. Contrary to what I expected, students were pretty secure with high frequency words, with the exception of were/where. Although it did take a great deal of time, I found this useful. Instead of just a vague funny feeling that my students weren't very strong with spelling, I had real data. I knew which kinds of words were problematic for students. I knew which students were lagging behind, and which were most proficient. As I plan for next year, I know that I want to do this again in the first few weeks of school. I don't think that a spelling percentage, on its own, is a particularly useful piece of data. However, when combined with a list of the words that students are misspelling, this percentage can become a powerful planning tool.